More Police Funding? Let Us Know! One of the key concerns we have locally is effective policing, and ensuring the Police have enough resources to keep us safe. At EHDC we have taken the unusual and innovative step of funding 3 full time PCSO’s and also purchasing 5 ANPR cameras for use exclusively in EHDC to support the Police. With the annual Council Tax reviews underway, our Police and Crime Commissioner is seeking support for a 1.99% increase in his share of the Council Tax to help fund the Police. for each home this is about £3.07 a year, and I support this. Please find below his comments, and how to take part in the survey. As Hampshire and the Island’s Police and Crime Commissioner, I am extremely proud that the Constabulary is a highly-regarded, well-performing and cost-effective force. It is the sixth lowest cost police force per head of population out of 41 forces in England and Wales. As a ‘lean’ force, the government’s funding cuts of £80m that have so far been imposed on Hampshire Constabulary have meant that we have had to make significant changes to the way it operates. This has created increasing pressure on maintaining high-quality policing services across Hampshire and the Isle of Wight. As PCC, this is of grave concern to me and I am obliged to question whether the constabulary can withstand any further cuts to government funding, which are to be on their way. The police get their funding from a number of sources but the two main ones are central government and the part of council tax which is allocated to the police. Police and Crime Commissioners are required to determine whether the amount of council tax they plan to raise is ‘excessive’. When the government placed a cap on the amount commissioners could impose last year, it left a significant shortfall in funding, despite overwhelming public support for a three per cent increase. Consequently, I was left with no choice but to cover the shortfall with reserves. As your Police and Crime Commissioner, I am committed to protecting front-line policing as far as possible despite the reductions in government grant. In my Police and Crime Plan, I made a commitment to improve and protect front-line policing and, in response, the constabulary has put neighbourhood policing at the heart of its operational model. With 33 per cent of the total policing budget coming from the council tax precept, and with the threat of continued funding cuts by the government, I am proposing a nominal increase of 1.99 per cent this year to help partially address that shortfall. This will generate an additional £2m for 2015/16 and equates to a rise of just £3.07 per annum, 26p per month, or 6p per week for an average band D household. For less than the cost of a box of 10 eggs, each household can help me to maintain the current policing levels and service. I would like to suggest that this is not an excessive amount to pay for what is already a low-cost, well performing force. 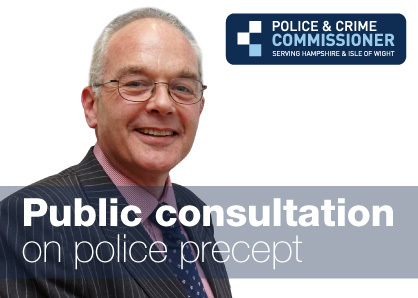 pcc.consultation@hampshire.pnn.police.uk or freepost to: Business Reply Plus, Licence Number RTGX-KSAA-AHBB, Office of the Police and Crime Commissioner, St Georges Chambers, St Georges Street, Winchester, SO23 8AJ.